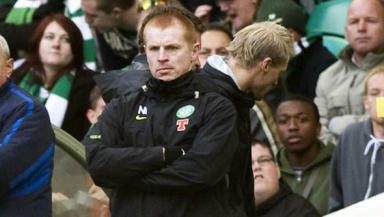 Neil Lennon says his players weren’t at their best in the 3-1 home defeat to Rangers. Neil Lennon saw Celtic lose in the SPL for the first time in his managerial career and conceded that his side did not perform well. Rangers ran out 3-1 winners in the first Old Firm match of the season after Celtic let slip a half-time lead. Gary Hooper had put Celtic in front before a Glenn Loovens own goal levelled the score. Kenny Miller volleyed home to put Rangers in front before adding a penalty when Daniel Majstorovic was judged to have fouled Kirk Broadfoot in the box. The penalty put the result beyond reasonable doubt but proved controversial with many observers feeling that Broadfoot had gone down under minimal contact. Lennon admitted that he had not seen a replay of the incident but said his first reaction was that the award had been generous to Rangers. "I'm not sure it was a penalty,” Lennon told Sky Sports. “I would need to see it again before I make my mind up. But, from where I was, it looked pretty soft. "There were a couple of decisions which I felt could have gone our way. I thought he was a bit lenient on a couple of players, especially when we were breaking particularly in the first half." Celtic had fielded six starters with no Old Firm experience but held possession for long spells. Despite being on the front foot after falling behind, the hoops couldn’t get back into the game and Lennon conceded they had not reached the standards he had hoped for. However, he said his players would take lessons from the game. "You don't like losing Old Firm games, particularly at home,” he said. “We will learn from this and hope the players take on board what's happened today and get back to winning ways. "I told them it wasn't good enough and it was unacceptable and they didn't do themselves justice."